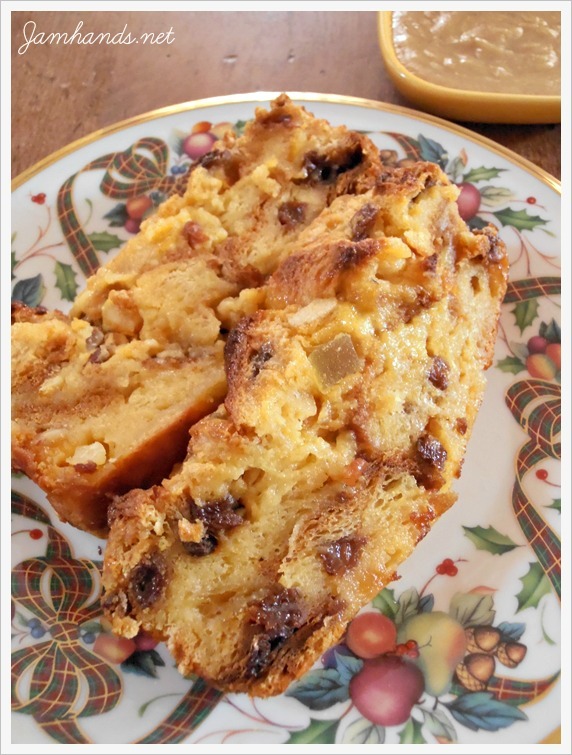 Are there any other Panettone fans out there? I wanted to try out a recipe to use up some panettone so I adapted a recipe from One Stitch Two Stitch. For my recipe I combined both panettone and eggnog. If you would prefer, you could use heavy cream instead of eggnog. Alternatively, you could use a raisin bread or cinnamon bread with the eggnog too. It is very adaptable. I have included the recipe for the vanilla sauce. It thickened up a bit too much for my liking, so I would probably go with a sprinkling of powdered sugar next time around. 1. Preheat oven to 350 degrees. Lightly coat a 9x5 in. foil lined baking pan with baking spray. Set aside. 2. Using and electric mixer, mix eggnog, eggs and sugar on medium speed for about a minute; then add in vanilla extract and nutmeg, and mix for another 30 seconds. 3. Cube the slices of bread and add them to the eggnog mixture. Mix on low-speed for 30 seconds. Let the bread/eggnog mixture sit for at least 10 minutes (this lets the bread absorb all the eggnog). 4. Pour bread mix evenly into prepared pan and bake for about 40-45 minutes or until knife inserted near center comes out clean. Cool for at least 20 minutes. Lift out of pan and slice. Adapted from One Stitch Two Stitch. 1. For vanilla sauce, whisk brown sugar, flour, cinnamon, egg, melted butter, whole milk, and salt together in a heavy saucepan until smooth. Heat over medium heat, whisking constantly, until thickened and the sauce coats the back of a spoon, 10 to 12 minutes. Stir in the vanilla extract. 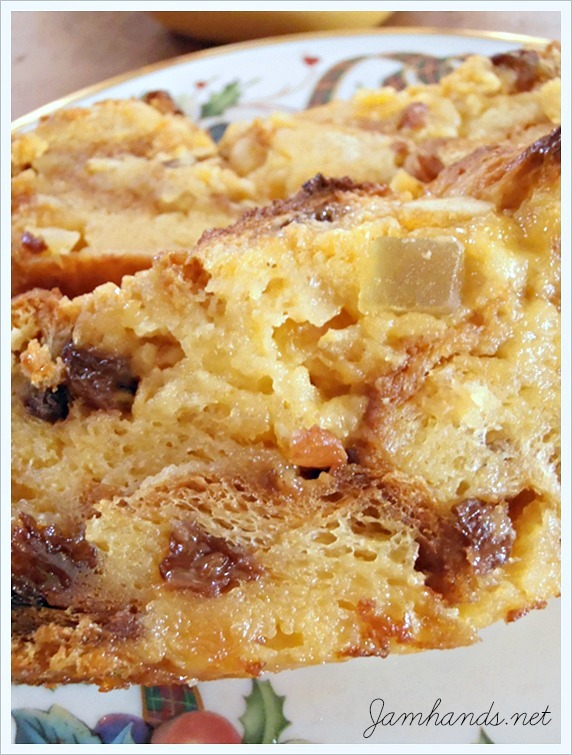 Pour sauce over warm bread pudding.